The kids of Perdido Beach have been living in the FAYZ for a year now. Kids have starved, died, developed mutant powers, and fought countless battles. Now that the barrier has gone transparent and they can see out into the rest of the world, it seems as though the end is near. The kids begin to worry about what will happen to them when the barrier does come down and how they will be treated by the rest of the world. But before they can even deal with those issues, they have to figure out how to stop the gaiaphage, or none of them will make it out alive. I have been a huge fan of this series for years now, and I was so amazed that each of these books have been better than the last. This series has been six books long and every single book in the series has been amazing. I’ve been anxiously awaiting Light because I’ve been so excited to see how this would all end. And once again, Michael Grant did not disappoint! This series has such a large group of characters, but Grant does a great job of giving each character their own voice. Each character has their own issues to deal with outside of the group’s issues, and each person has changed greatly since the FAYZ was created. Some people became leaders while others became cowards. But what is amazing is that some characters have changed completely just in the last few books and have become the type of person you never expected them to come. The character growth has always been very nicely done in this series, and in this book especially it seems like each character grew tremendously. The kids start to realize that the barrier is going to come down soon, and not everyone is happy about it. Sam for instance, was last seen murdering Penny on national TV, so he is almost positive that once the barrier comes down he will be thrown in jail. The people outside the barrier have no idea about the horrors that the kids have faced inside and the things they have had to do to stay alive. Many of the kids have more experience with war than some people in the armed forces. It is hard for Sam and the others to imagine just going back to high school and returning to their lives, because it seems like in the past year they have grown into adults. What I thought was really interesting is that one of the characters asks if the adults had been present in the FAYZ, would they have run things better or worse? This is an interesting question, because while adults may be more knowledgeable about things like medicine and procuring food, adults also do not have the same innocence that many children have. The kids also have to deal with the gaiaphage, who is growing at a rapid rate and has more mutant powers than any of the other kids. They know they will have to fight, but they are unsure if any of them will make it out alive. The gaiaphage wants to kill them all and seems to actually take pleasure in causing pain. Plus, kids have started starving again because they are all sitting at the barrier talking to their parents rather than working, so there is no food being grown. It’s crazy how much these poor kids have gone through in the past year, but they are still so resilient. This book wrapped everything up nicely and didn’t leave any questions at the end. We finally get the answers as to why the FAYZ happened and what the gaiaphage actually is, and what Little Pete’s role in the whole thing was. Also, we get the back story of Sam and Caine and why their mother only kept Sam. I really liked the way this ended, and I think Grant really accurately portrayed the way the media would react in this situation. Overall, Light was an excellent conclusion to the Gone series. I will miss reading about these incredible kids, but I really enjoyed the ending. 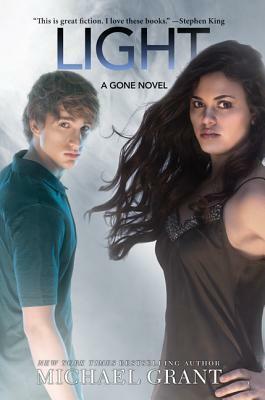 Light was released on April 2, 2013 and is the final book in the Gone series.